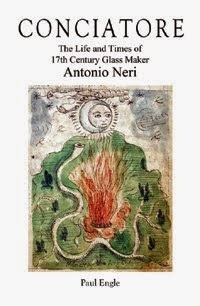 In early 1603, Glassmaker Antonio Neri traveled from Italy to Flanders, to visit his friend Emmanuel Ximenes. Neri would stay for seven years and in that time he worked on a number of glass related projects including the manufacture of artificial gems using lead crystal glass. An enduring mystery is that in his glass book L'Arte Vetraria, he gives credit to alchemist Isaac Hollandus for a "new chemical method never before used," yet no such recipe for artificial gems has ever been found in the writings of Hollandus. Above all is this wonderful invention. A new way practiced by me, with the doctrine taken from Isaac Hollandus, in which paste jewels of so much grace, beauty and perfection are made, that they seem nearly impossible to describe and hard to believe. In the 1679 German edition of L'Arte Vetraria, Johannes Kunckel implies that Isaac was dead before Neri came to Antwerp, writing "This is the manner to imitate precious stones, of Isaac Hollandus, (namely, from his posthumous writings) that I [Neri] learned in Flanders" (emphasis added). Yet, coinciding with Neri's visit, playwright Ben Jonson who had just returned to London from the war in Flanders, referenced the pair in his satirical work The Alchemist (1610). There he implies that the elder Hollandus was then dead but survived by "living Isaac." In 1644, the famous Flemish chemist Van Helmont identified Isaac Hollandus as a recent contemporary. In a 1716 treatise, Kunckel paid Hollandus a great compliment and at the same time took a swipe at Helmont saying "and the incomparable Hollandus had more of the fire-art in his little finger as Helmont in his whole body." In another reference, Sir Francis Bacon mentions Hollandus as "by far the greater part of the crowd of chemists." One Hollandus title in Ximenes' Antwerp library was Opera Mineralia, first published in 1600. The subject of this volume is the philosopher's stone and its production. 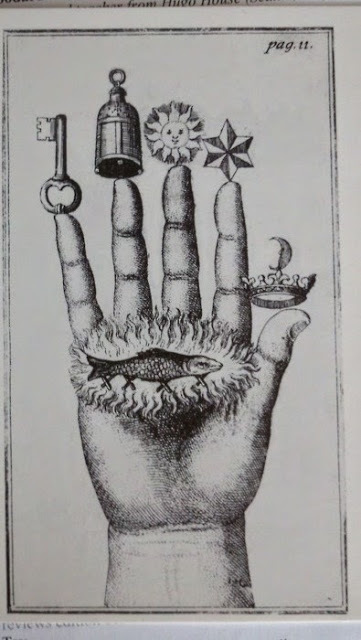 While there are no artificial gem recipes here per se, there are some intriguing connections between artificial gems and the philosopher's stone, both philosophical and practical. It was thought that the colors of metallic based glass pigments were an indication that the metals were "opened" and became susceptible to alchemical transmutation. Of special interest was the deep red ruby color made by adding gold to the glass melt. In the introduction to a 1797 French translation of Neri's book, artificial ruby or "vitrified gold," is equated to the bible's Electrum of Ezekiel —a red glow seen by the prophet in a vision. By the mid-eighteenth century, Isaac Hollandus was lauded in industrial arts books as a genius of artificial gems. He may well have been, but the evidence does not support it. All of the specific recipes attributed to Hollandus seem to lead back to Neri's L'Arte Vetraria or its translations. A case can be made that Hollandus' reputation for artificial gems stems from a 1697 plagiarized version of Neri's book. A volume published in France by Haudicquer Blancourt that gives no credit to the Florentine priest. Blancourt used Christopher Merrett's English edition as his base and added to the recipes with his own embellishments. The chapter on artificial gems still lauds Hollandus, but its length was now doubled from the seventeen original recipes to thirty-five. The size of this one section jumped from thirteen to nearly two hundred pages, an increase in page-count larger than Neri's entire book. In 1699, Blancourt's version was then translated back into English, again without reference to Neri. There is no doubt that these two editions, with their expanded chapters on paste gems exerted a strong influence on later craftsmen. They may also be the source of the credit given to Hollandus' for paste gems in the eighteenth and nineteenth centuries. A number of intriguing questions remain unanswered. Chief among them is the nature of Neri’s association with the Dutch alchemist(s). Was Hollandus or his son alive in the first decade of the seventeenth century and did Neri meet with either of them in person? We can only guess. The Hollandus men are notable, if not enigmatic, characters in the transition from alchemy to modern chemistry. Historians would very much like to know them better. Nevertheless, there can be no doubt of the strong impact Hollandus made on Neri. Isaac holds a singular honor as the one person named in Neri's book to whom he gives specific credit. As research on early modern science has progressed, the importance of communication between practitioners has emerged as a central theme. A meeting of the minds between Neri and Hollandus, if it ever occurred, would rank as a prime example of technology transfer with a definite impact. For a comprehensive look at Hollandus see: Annelies van Gijsen, "Isaac Hollandus Revisited" in Chymia: science and nature in Medieval and early modern Europe, Miguel Lòpez-Pèrez, Dider Kahn; Mar Rey Bueno, eds., (Newcastle upon Tyne, UK: Cambridge Scholars, 2010), pp. 310–324. *This post first appeared here 2 April 2014.
any use of zinc oxide in glass making recepies? Or Calamine if you will..